These two lotions are both great, but we had to knock the equate lotion down a bit for its chemical-like smell. The ingredient panels are very similar, but the equate version has a few more ingredients, which likely lends itself to the smell difference. These both have a nice consistency and feel, but we think you will prefer the smell of the Aveeno lotion. Brandefy compares off brands (i.e., Equate) to name brands (i.e., Aveeno) to share when the generic is as good as the name brand, and to warn you when it is not. Our purpose is to help you save time and money, and to have a good time while doing it. We have researched and found that the new formula of the Aveeno Daily Moisturizer is a popular product. Of course, that sets us on a mission to find a great dupe to save consumers some cash. We liked the packaging of both of these lotions, and found the consistency and after-feel of both lotions to be quite similar. Both of these lotions have nearly identical active ingredients, and similar inactive ingredients. 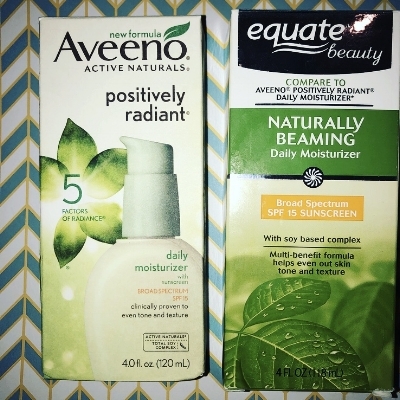 The difference here is that equate has a few more ingredients than the Aveeno version. We also all found the Aveeno lotion to smell much better than the equate version. If smell doesn't bother you, you will probably like the generic just as much. If it does, you may want to purchase the name-brand on this one.